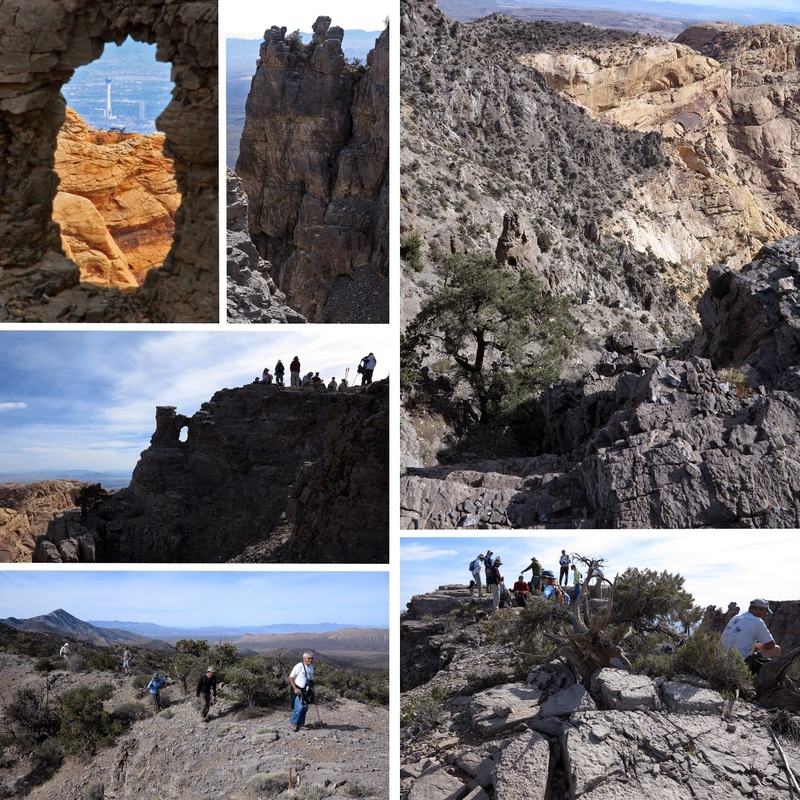 Today's hike was a well-kept secret to many of the sixteen hikers that participated. The Around the Bend Friends often hike far and wide in this area and for miles around but we have neglected to notice what was in our own backyard, so to speak. The destination of the 5 mile hike that Chris took us on today was the Lost Creek Waterfall and the area above it. We found this higher area so beautiful and we were so dumbfounded that we previously didn't know it was there that we thought a good name for it would be Treasure Cove, or just "Above Lost Creek Waterfall." ... Either one. 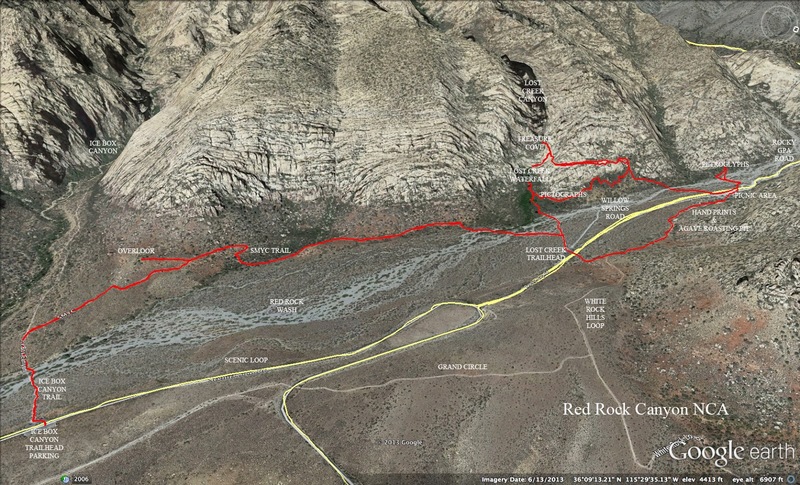 We began our hike at the Ice Box Canyon trailhead parking lot. 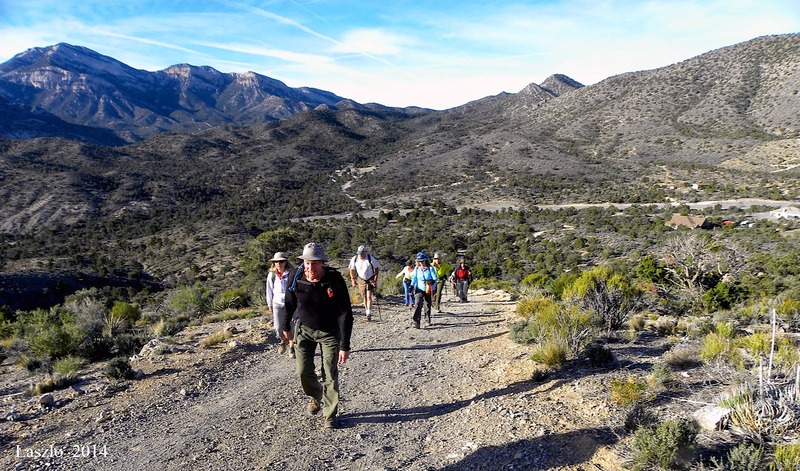 From the Ice Box Canyon Trail, we connected with the SMYC Trail and made our way over to the Lost Creek Trail junction not far from the Willow Springs Road. When we turned left onto the Lost Creek Trail, most of us were immediately in another world. This is a trail where many school buses unload hundreds of kids every year for their day out of class. It is part of the Children's Discovery Trail and, in fact, hiking this fun trail makes you feel like a kid again! We walked the boardwalk, climbed past the many-rooted ponderosa pine, and slipped through a rock tunnel. Soon, we arrived at the Lost Creek Waterfall. Today, the waterfall was but a trickle but the spray was accented by a half bloomed red bud tree at the base. We got our photos and looked up. At the lip of the waterfall, was a tiny spout. Our next stop would be up there. Hmmm. "How do we get up there?" we asked Chris. Never one to say too much too soon, Chris just gave us a look and said, "Not sure." So, we turned and hiked back down the trail until just before we got to the boardwalk again. Then, we turned left. This trail took us up past an ancient Native American rock shelter. There are a few pictographs on the rock and an information sign behind the protective fence. This is the area that was damaged by a graffiti artist a couple of years ago. There was a very large fine bestowed on this wayward youth. Onward, we hiked. We circled the ridge point around to the left and began climbing up between two rock walls. From there, the trail took us up to the base of the cliff wall on our left. The trail along the wall was fun and we joked at the thought that it would be shorter to get to the top by just climbing up the wall. Eventually, we reached an area of foliage where there was a steep trail climbing up to the top of the wall. (This was probably easier than climbing the wall!) At any rate, when we reached the top of the wall, we found a rock shelf wide enough to hike. Our target was now laterally back around the ridge point. We needed to follow the shelf and small trail in that direction. There were a few places along the shelf that were a little dicey. Not too bad but just enough to make it fun! As we hiked around the corner to the right, a huge beautiful canyon came into view. Slithering down the rock was Lost Creek. We gasped in awe. ... (Well, we did.) The area was, until now, an undiscovered treasure. The photos undoubtedly do not do Treasure Cove justice. Below us was a chunky water slide down to the top of Lost Creek Waterfall. Above us was a deep canyon from which the water flowed. At our level, there was a wonderful place to cool our heels. So we sat and explored and made a video for a club member's retirement party and took a lot of pictures. We were in no hurry to leave. When we finished our break, Chris took us down to the top of the falls before returning around the shelf. 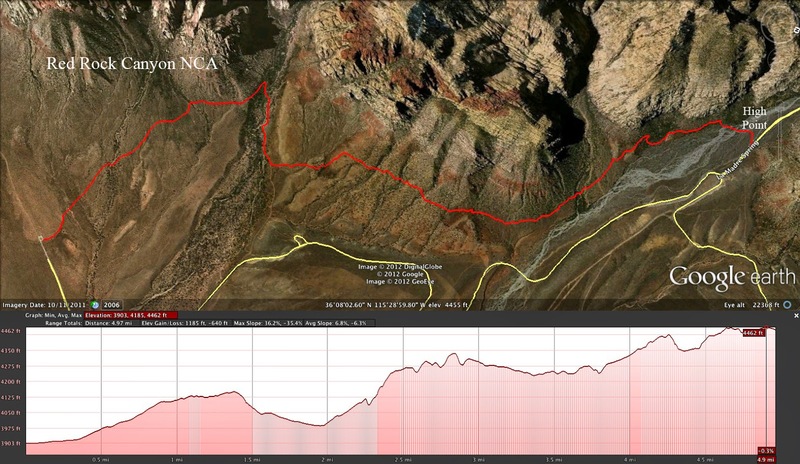 At the end of the shelf, our route dropped straight down to Willow Springs Road. 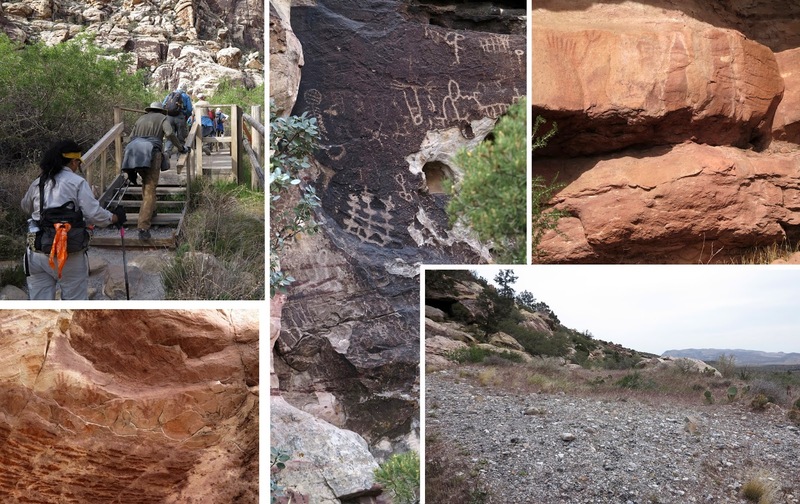 We hiked up the road and out the trail to view the petroglyphs on the other side of the Red Rock Wash then returned and crossed the road at the picnic area. After a convenient restroom break, we hiked out the White Rock Hills Loop trail and passed the hand prints and the agave roasting pit. We were doing the "Willow Springs Cultural Experience!" When we passed the trail junction where the White Rock Hills Trail continued up the hill, we went straight and crossed the road again to the Lost Creek Trailhead. There was a school bus in the parking lot and lots of kids hiking the discovery trail by now. We connected straight onto the SMYC Trail and followed it back to the Ice Box Canyon Trail and back to the cars. This hike was definitely a keeper! 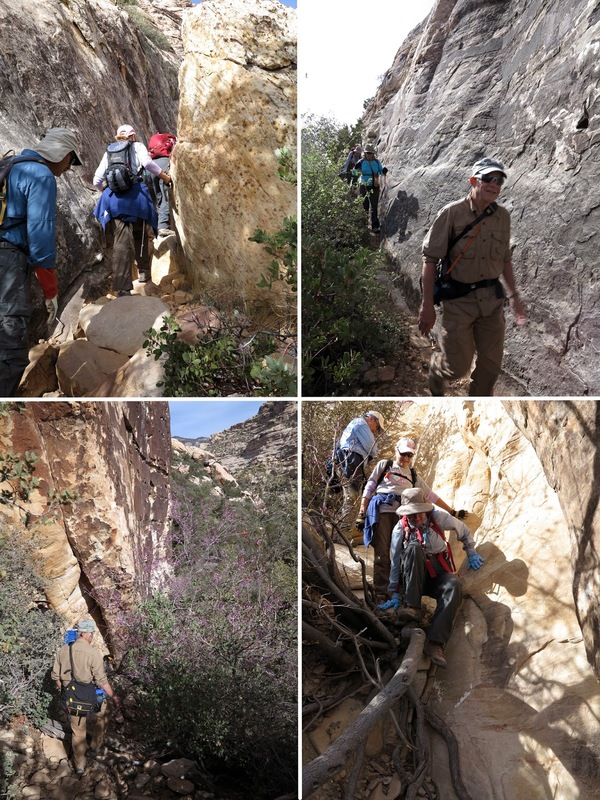 Twenty-one hikers participated on a leisurely Escarpment Base Trail hike today. 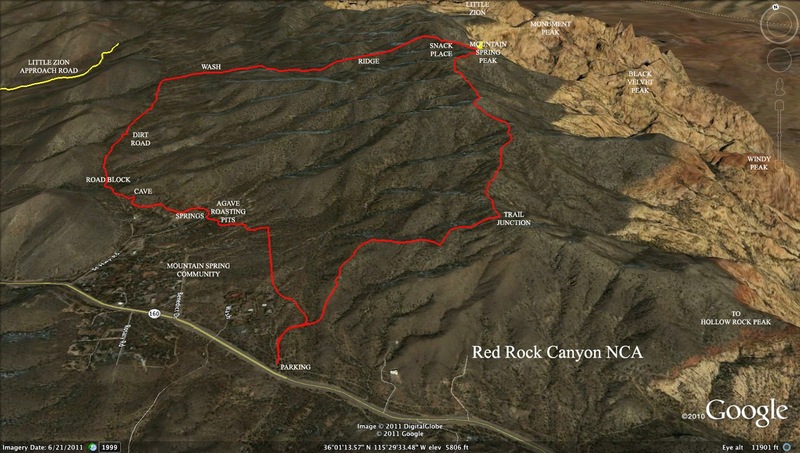 This is a point-to-point hike located inside the scenic loop at Red Rock Canyon NCA. 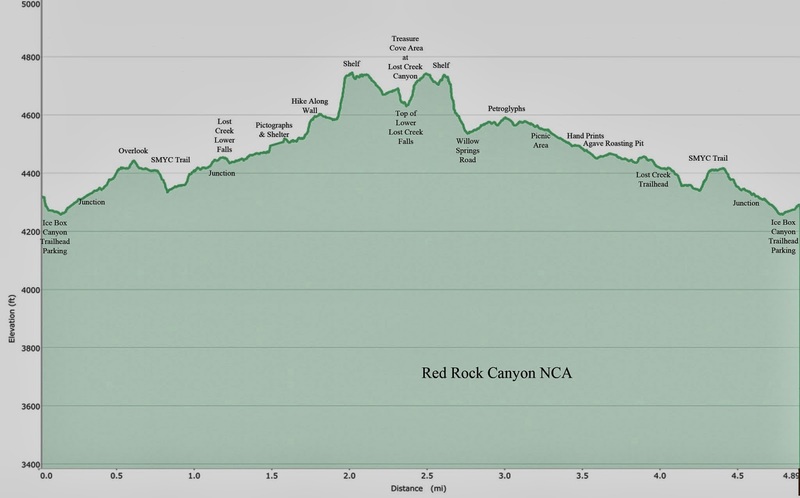 We dropped off a set of cars at the Lost Creek Trailhead, then transported all the hikers down to the Oak Creek Trailhead with another set of cars. 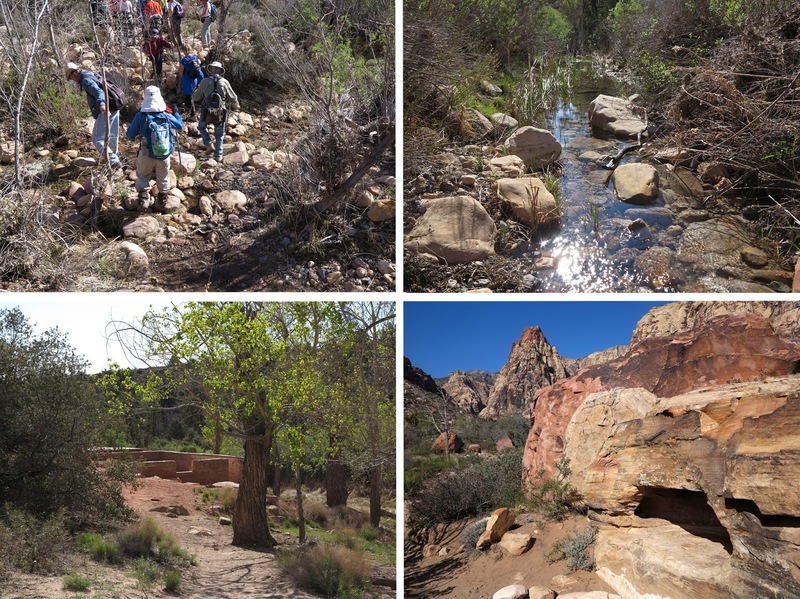 The hike begins on the Arnight Trail that led us along the base of Juniper Canyon and on down to the Pine Creek Trail. We passed the old Wilson homestead after crossing the creek and hung a left onto Dale's Trail. 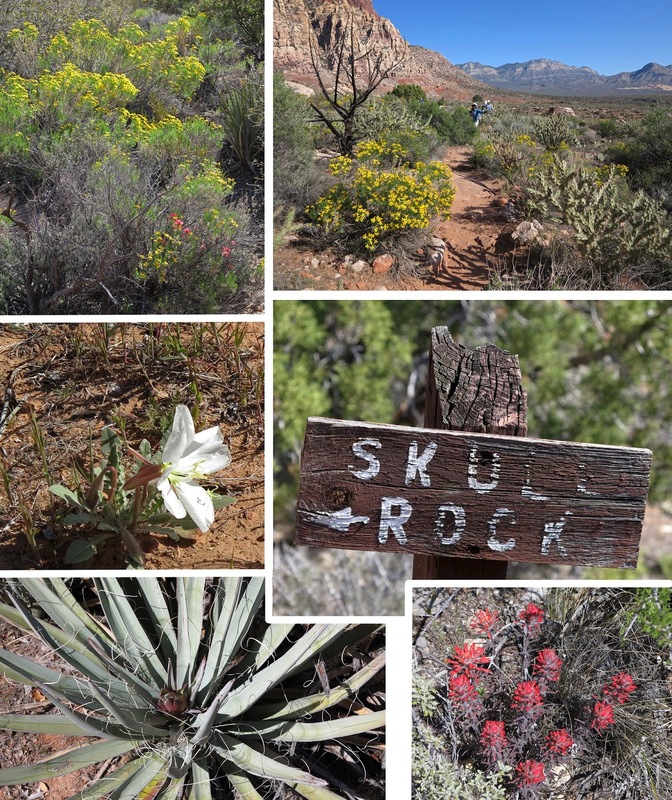 Dale's Trail is one of Red Rock's most beautiful trails in the springtime. There are many wildflowers framed by large colorful sandstone boulders. It is like one giant rock garden. We stopped at Skull Rock for our break half way through the hike. Skull Rock is a large brown sandstone rock that has indentations that make it appear as a human skull. The juniper tree that has grown up in front of it now hides the skull appearance. Dale's Trail has several arroyos that it crosses. Therefore, there are several times that we had to hike down and up hills as we went. Each time we gained another hill, our fearless leader, Nancy, allowed hikers time to catch their breath. The weather was beautiful but when the wind wasn't blowing, the sun tended to heat things up a bit. 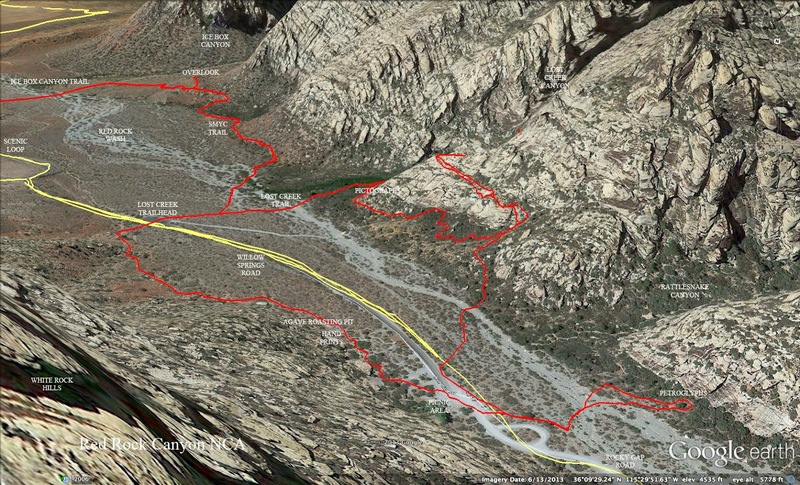 We continued across Dale's Trail passing the park bench and junctioned with Ice Box Canyon Trail. 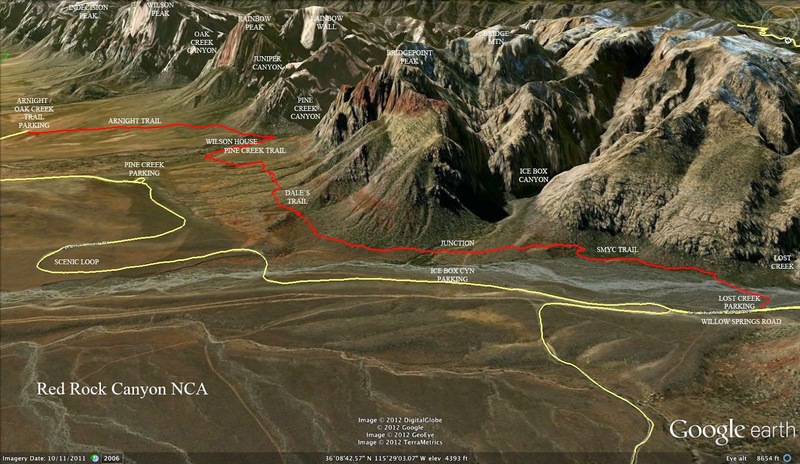 Getting through this area can be tricky but we forged ahead and kept our route as straight as we could. Soon, we knew we were out of danger and were well on our way on the SMYC Trail. 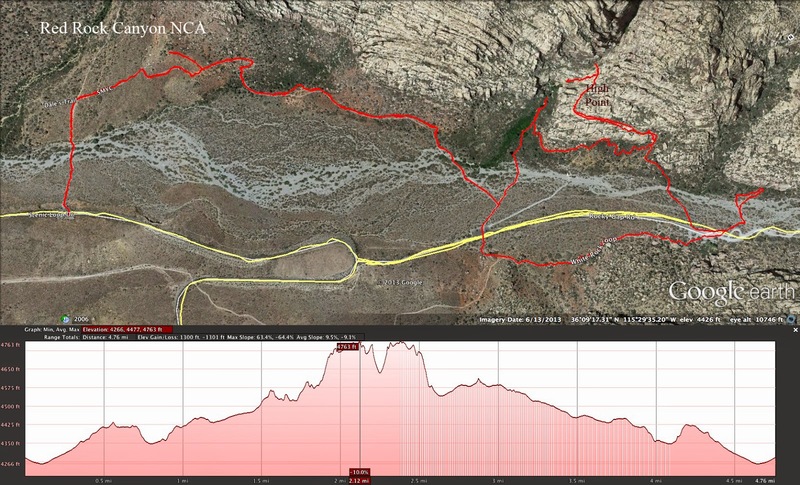 The SMYC Trail had a few more ups and downs but, mostly, it afforded nice views out to the valley floor. When we stopped one time for a rest, we saw three healthy mule deer below us in the wash. Luckily, we didn't notice any mountain lions ...! Eventually, we were finally finishing the hike at the Lost Creek Trailhead. Pleasant outing. 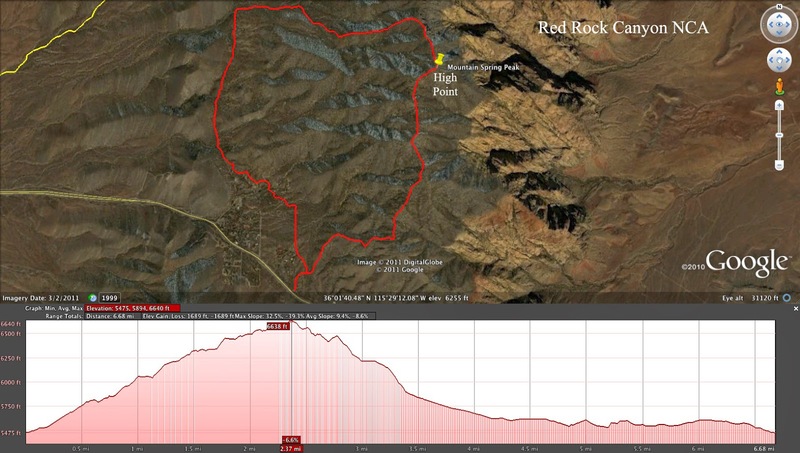 5 miles; 1145 feet elevation gain; 575 feet elevation loss; and who cares how long it took! 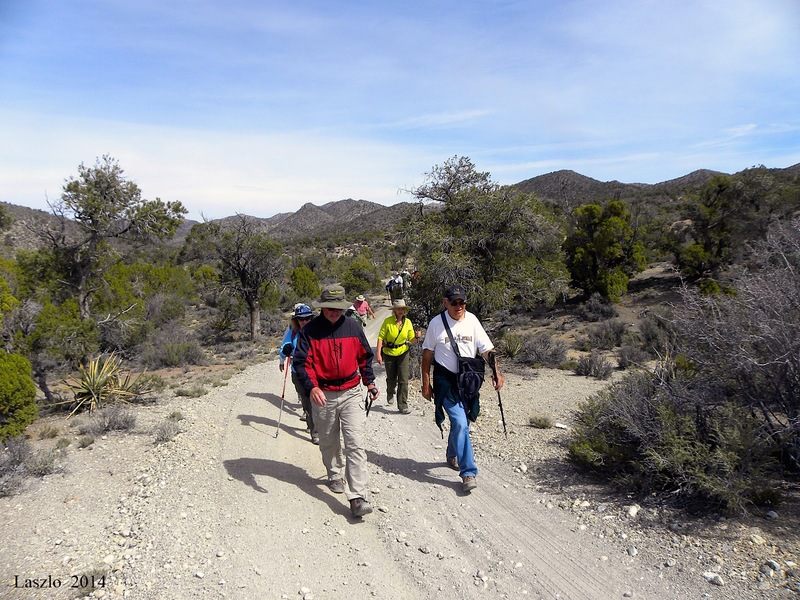 For the third time in a week, club members started at the Highway 160 pass Mountain Spring, NV trailhead. 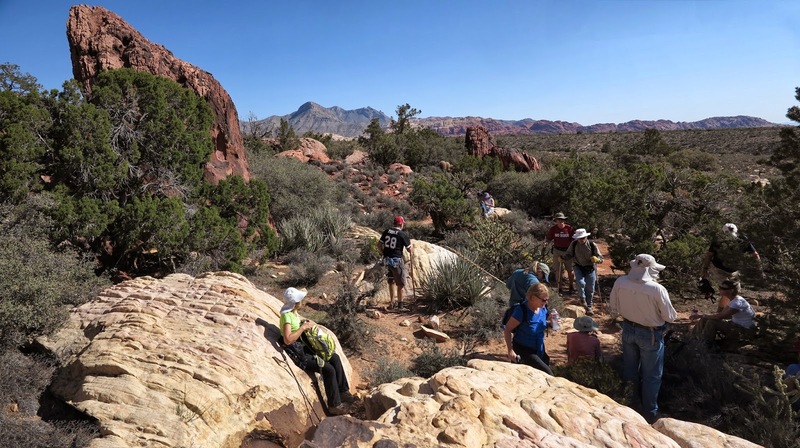 Nineteen hikers converged on heartbreak hill for a great loop hike over Mountain Spring Peak, a peak located on the limestone part of the Red Rock Canyon NCA escarpment just behind the sandstone Black Velvet Peak. We arrived at the trail junction saddle a few at a time and waited for the rest to arrive. We were all there within the same five minutes. The line of hikers began to spread out on the trail but we gathered again when we reached Mountain Spring Peak where we all signed into the log register and took in more of the grand views. After finishing up on the peak, we continued along the trail to the other side and found ourselves again at the cliff edge of the escarpment. 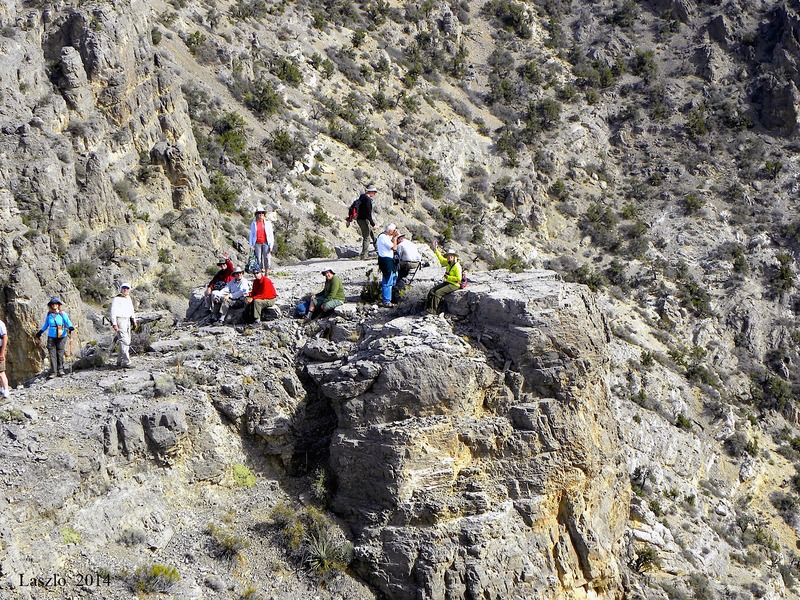 Taking a short side trip, several hikers balanced out onto a narrow limestone cliff peninsula. Just past here, the trail led us to a seating area right on a very high cliff. This was where we took a snack break and enjoyed the photo opportunities. On the side of the snack cliff, there is a very small window through which the Stratosphere Tower can be seen. The trail continued along the ridge but we took a left down the next ridge dropping down to the left side. This was a fairly steep descent in soft dirt and rock down to the small wash below. 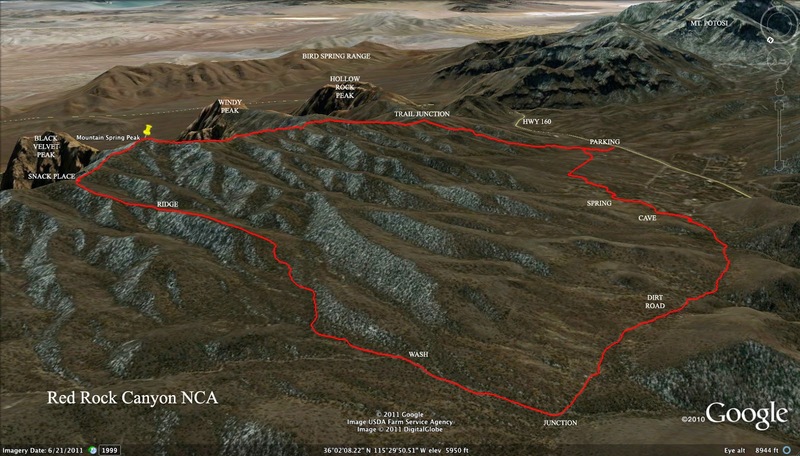 Another possible route would be to continue out the initial ridge until the slope drops you into the wash. At any rate, there is very little trail to follow here nor is the route marked by cairns. The first wash that we reached was small and rocky. Brush covered it intermittently. The descent through the wash is a good workout for a multitude of muscles. Eventually, the wash gets bigger and less brushy. As the slope levels out, the wash gets wider and junctions with other washes. Looking for the cairn marker on the left, we turned into another wide sandy wash that soon emptied us out onto Rainbow Springs Road, a dirt high clearance road that begins in Mountain Spring and ends at Rainbow Springs behind the escarpment. We hiked along the road for a mile. Footing here is unpleasant due to the steep sides of the road bed. After the mile, we turned up to our left onto a trail that took us to a rock outcropping and cave. The cave diversion is welcome after the long road hike. Some hikers climbed up through the hole then we all met again on the dirt road. This side trip cut off a corner of the road's route. We hiked past the two springs above the community. Turned left to observe a beautiful ancient agave roasting pit. Then began a cross country hike aiming in the direction of the cars at the trailhead. This brought us through a residential section of the country town and we were met by two very excited shetland ponies in an enclosure by the trail. Then nineteen satisfied hikers reached their cars. Shetland Ponies - Very Happy to Have Visitors!